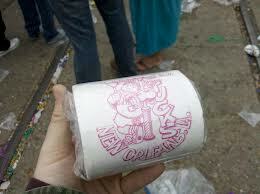 Carnival New Orleans News | Tucks Can Keep Throwing Toilet Paper!! « Tossed from Metairie, Krewe of Zeus Withdraws their St. Charles Parish Application! Tucks Can Keep Throwing Toilet Paper!! 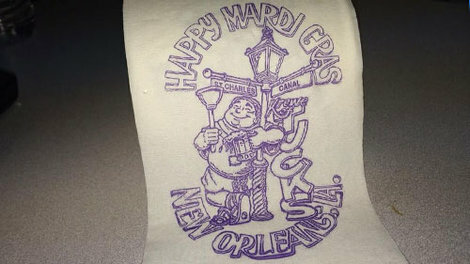 New Mardi Gras rules were passed by our esteemed New Orleans city council this week. Among the highlights- no more generators on truck floats, instead power inverters that run off the engine are required. No children under the age of 3 can ride on a float. Tougher fire codes were enacted for flambeaux and floats. A limit on the number of parade permits was instituted. No more than 30 permits can be issued annually, though if you have a permit now, you can keep it. 33 organizations have permits at this time. Attrition will eventually lower the number of permits to 30. But the most important regulation allows Tucks to continue to throw their beloved icon throw, Tucks Bathroom Tissue!! Councilwomen LaToya Cantrell said it wasn’t really a safety issue. When these rules were first proposed, Tucks paper was tossed. Eventually after a strong outcry, Cantrell changed her mind and removed the ban from the bill. Good for her, she knows what’s important to the people of New Orleans. This is the second package of Carnival rules pushed through by the council this year. The last bill contained updated regulations about throwbacks, ladders and sectioning off space on the neutral ground. Cantrell said she is working on an additional measure, one ending the practice of throwing packs/bags of beads and very heavy beads. Many float riders hand these off, but that’s not always possible, especially for 2nd story riders on double decker floats. This entry was posted by NewOrleansMusicMan on August 16, 2014 at 7:29 pm, and is filed under Krewe of Tucks, Mardi Gras, New Orleans. Follow any responses to this post through RSS 2.0. You can leave a response or trackback from your own site.